In the design of large and complex digital systems, it is often necessary to have one device communicate digital information to and from other devices. One advantage of digital information is that it tends to be far more resistant to transmitted and interpreted errors than information symbolized in an analog medium. This accounts for the clarity of digitally-encoded telephone connections, compact audio disks, and for much of the enthusiasm in the engineering community for digital communications technology. However, digital communication has its own unique pitfalls, and there are multitudes of different and incompatible ways in which it can be sent. Hopefully, this chapter will enlighten you as to the basics of digital communication, its advantages, disadvantages, and practical considerations. Suppose we are given the task of remotely monitoring the level of a water storage tank. Our job is to design a system to measure the level of water in the tank and send this information to a distant location so that other people may monitor it. Measuring the tank's level is quite easy, and can be accomplished with a number of different types of instruments, such as float switches, pressure transmitters, ultrasonic level detectors, capacitance probes, strain gauges, or radar level detectors. For the sake of this illustration, we will use an analog level-measuring device with an output signal of 4-20 mA. 4 mA represents a tank level of 0%, 20 mA represents a tank level of 100%, and anything in between 4 and 20 mA represents a tank level proportionately between 0% and 100%. If we wanted to, we could simply send this 4-20 milliamp analog current signal to the remote monitoring location by means of a pair of copper wires, where it would drive a panel meter of some sort, the scale of which was calibrated to reflect the depth of water in the tank, in whatever units of measurement preferred. This analog communication system would be simple and robust. For many applications, it would suffice for our needs perfectly. But, it is not the only way to get the job done. 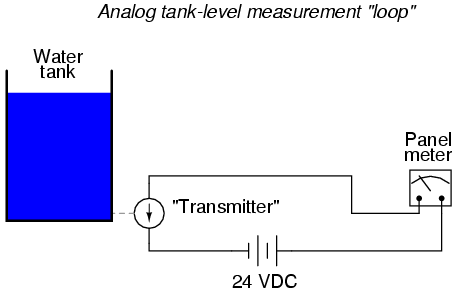 For the purposes of exploring digital techniques, we'll explore other methods of monitoring this hypothetical tank, even though the analog method just described might be the most practical. Each of these switches is wired to close a circuit, sending current to individual lamps mounted on a panel at the monitoring location. 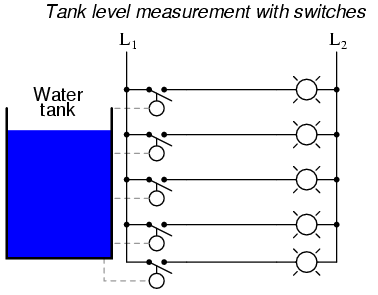 As each switch closed, its respective lamp would light, and whoever looked at the panel would see a 5-lamp representation of the tank's level. Being that each lamp circuit is digital in nature -- either 100% on or 100% off -- electrical interference from other wires along the run have much less effect on the accuracy of measurement at the monitoring end than in the case of the analog signal. A huge amount of interference would be required to cause an "off" signal to be interpreted as an "on" signal, or vice versa. 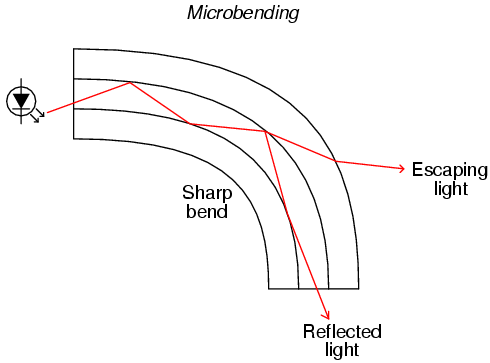 Relative resistance to electrical interference is an advantage enjoyed by all forms of digital communication over analog. Now, only 4 wires (plus any ground and power wires necessary) are needed to communicate the information, as opposed to 16 wires (plus any ground and power wires). At the monitoring location, we would need some kind of display device that could accept the 4-bit binary data and generate an easy-to-read display for a person to view. A decoder, wired to accept the 4-bit data as its input and light 1-of-16 output lamps, could be used for this task, or we could use a 4-bit decoder/driver circuit to drive some kind of numerical digit display. Still, a resolution of 1/16 tank height may not be good enough for our application. To better resolve the water level, we need more bits in our binary output. We could add still more switches, but this gets impractical rather quickly. A better option would be to re-attach our original analog transmitter to the tank and electronically convert its 4-20 milliamp analog output into a binary number with far more bits than would be practical using a set of discrete level switches. Since the electrical noise we're trying to avoid is encountered along the long run of wire from the tank to the monitoring location, this A/D conversion can take place at the tank (where we have a "clean" 4-20 mA signal). There are a variety of methods to convert an analog signal to digital, but we'll skip an in-depth discussion of those techniques and concentrate on the digital signal communication itself. The type of digital information being sent from our tank instrumentation to the monitoring instrumentation is referred to as parallel digital data. That is, each binary bit is being sent along its own dedicated wire, so that all bits arrive at their destination simultaneously. This obviously necessitates the use of at least one wire per bit to communicate with the monitoring location. We could further reduce our wiring needs by sending the binary data along a single channel (one wire + ground), so that each bit is communicated one at a time. This type of information is referred to as serial digital data. We could use a multiplexer or a shift register to take the parallel data from the A/D converter (at the tank transmitter), and convert it to serial data. At the receiving end (the monitoring location) we could use a demultiplexer or another shift register to convert the serial data to parallel again for use in the display circuitry. 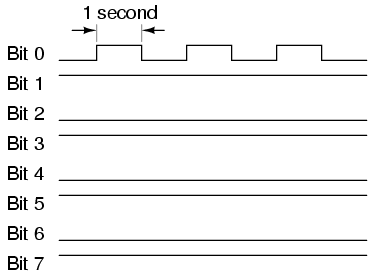 The exact details of how the mux/demux or shift register pairs are maintained in synchronization is, like A/D conversion, a topic for another lesson. Fortunately, there are digital IC chips called UARTs (Universal Asynchronous Receiver-Transmitters) that handle all these details on their own and make the designer's life much simpler. For now, we must continue to focus our attention on the matter at hand: how to communicate the digital information from the tank to the monitoring location. Aside from the issues of the physical network (signal types and voltage levels, connector pinouts, cabling, topology, etc. ), there needs to be a standardized way in which communication is arbitrated between multiple nodes in a network, even if it's as simple as a two-node, point-to-point system. When a node "talks" on the network, it is generating a signal on the network wiring, be it high and low DC voltage levels, some kind of modulated AC carrier wave signal, or even pulses of light in a fiber. Nodes that "listen" are simply measuring that applied signal on the network (from the transmitting node) and passively monitoring it. If two or more nodes "talk" at the same time, however, their output signals may clash (imagine two logic gates trying to apply opposite signal voltages to a single line on a bus! ), corrupting the transmitted data. The standardized method by which nodes are allowed to transmit to the bus or network wiring is called a protocol. There are many different protocols for arbitrating the use of a common network between multiple nodes, and I'll cover just a few here. However, it's good to be aware of these few, and to understand why some work better for some purposes than others. Usually, a specific protocol is associated with a standardized type of network. This is merely another "layer" to the set of standards which are specified under the titles of various networks. The International Standards Organization (ISO) has specified a general architecture of network specifications in their DIS7498 model (applicable to most any digital network). Consisting of seven "layers," this outline attempts to categorize all levels of abstraction necessary to communicate digital data. Level 1: Physical Specifies electrical and mechanical details of communication: wire type, connector design, signal types and levels. Level 2: Data link Defines formats of messages, how data is to be addressed, and error detection/correction techniques. Level 3: Network Establishes procedures for encapsulation of data into "packets" for transmission and reception. Level 4: Transport Among other things, the transport layer defines how complete data files are to be handled over a network. Level 5: Session Organizes data transfer in terms of beginning and end of a specific transmission. Analogous to job control on a multitasking computer operating system. Level 6: Presentation Includes definitions for character sets, terminal control, and graphics commands so that abstract data can be readily encoded and decoded between communicating devices. Level 7: Application The end-user standards for generating and/or interpreting communicated data in its final form. In other words, the actual computer programs using the communicated data. Some established network protocols only cover one or a few of the DIS7498 levels. For example, the widely used RS-232C serial communications protocol really only addresses the first ("physical") layer of this seven-layer model. Other protocols, such as the X-windows graphical client/server system developed at MIT for distributed graphic-user-interface computer systems, cover all seven layers. 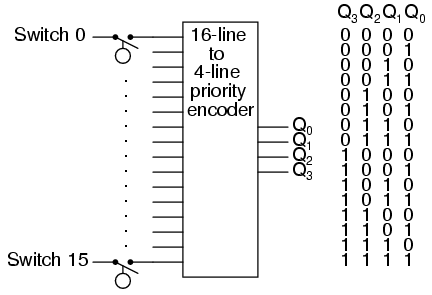 Different protocols may use the same physical layer standard. An example of this is the RS-422A and RS-485 protocols, both of which use the same differential-voltage transmitter and receiver circuitry, using the same voltage levels to denote binary 1's and 0's. On a physical level, these two communication protocols are identical. However, on a more abstract level the protocols are different: RS-422A is point-to-point only, while RS-485 supports a bus topology "multidrop" with up to 32 addressable nodes. Perhaps the simplest type of protocol is the one where there is only one transmitter, and all the other nodes are merely receivers. 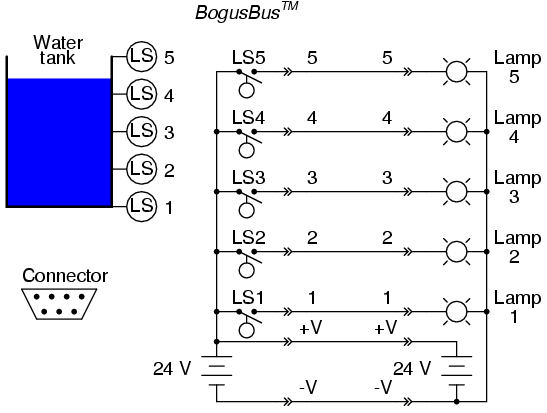 Such is the case for BogusBus, where a single transmitter generates the voltage signals impressed on the network wiring, and one or more receiver units (with 5 lamps each) light up in accord with the transmitter's output. This is always the case with a simplex network: there's only one talker, and everyone else listens! When we have multiple transmitting nodes, we must orchestrate their transmissions in such a way that they don't conflict with one another. Nodes shouldn't be allowed to talk when another node is talking, so we give each node the ability to "listen" and to refrain from talking until the network is silent. This basic approach is called Carrier Sense Multiple Access (CSMA), and there exists a few variations on this theme. Please note that CSMA is not a standardized protocol in itself, but rather a methodology that certain protocols follow. One variation is to simply let any node begin to talk as soon as the network is silent. This is analogous to a group of people meeting at a round table: anyone has the ability to start talking, so long as they don't interrupt anyone else. As soon as the last person stops talking, the next person waiting to talk will begin. So, what happens when two or more people start talking at once? 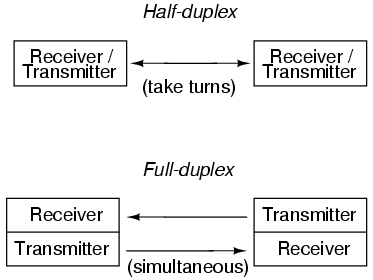 In a network, the simultaneous transmission of two or more nodes is called a collision. With CSMA/CD (CSMA/Collision Detection), the nodes that collide simply reset themselves with a random delay timer circuit, and the first one to finish its time delay tries to talk again. This is the basic protocol for the popular Ethernet network. Another variation of CSMA is CSMA/BA (CSMA/Bitwise Arbitration), where colliding nodes refer to pre-set priority numbers which dictate which one has permission to speak first. In other words, each node has a "rank" which settles any dispute over who gets to start talking first after a collision occurs, much like a group of people where dignitaries and common citizens are mixed. If a collision occurs, the dignitary is generally allowed to speak first and the common person waits afterward. In either of the two examples above (CSMA/CD and CSMA/BA), we assumed that any node could initiate a conversation so long as the network was silent. This is referred to as the "unsolicited" mode of communication. There is a variation called "solicited" mode for either CSMA/CD or CSMA/BA where the initial transmission is only allowed to occur when a designated master node requests (solicits) a reply. Collision detection (CD) or bitwise arbitration (BA) applies only to post-collision arbitration as multiple nodes respond to the master device's request. An entirely different strategy for node communication is the Master/Slave protocol, where a single master device allots time slots for all the other nodes on the network to transmit, and schedules these time slots so that multiple nodes cannot collide. The master device addresses each node by name, one at a time, letting that node talk for a certain amount of time. When it is finished, the master addresses the next node, and so on, and so on. Yet another strategy is the Token-Passing protocol, where each node gets a turn to talk (one at a time), and then grants permission for the next node to talk when it's done. Permission to talk is passed around from node to node as each one hands off the "token" to the next in sequential order. The token itself is not a physical thing: it is a series of binary 1's and 0's broadcast on the network, carrying a specific address of the next node permitted to talk. Although token-passing protocol is often associated with ring-topology networks, it is not restricted to any topology in particular. And when this protocol is implemented in a ring network, the sequence of token passing does not have to follow the physical connection sequence of the ring. Just as with topologies, multiple protocols may be joined together over different segments of a heterogeneous network, for maximum benefit. For instance, a dedicated Master/Slave network connecting instruments together on the manufacturing plant floor may be linked through a gateway device to an Ethernet network which links multiple desktop computer workstations together, one of those computer workstations acting as a gateway to link the data to an FDDI fiber network back to the plant's mainframe computer. Each network type, topology, and protocol serves different needs and applications best, but through gateway devices, they can all share the same data. It is also possible to blend multiple protocol strategies into a new hybrid within a single network type. Such is the case for Foundation Fieldbus, which combines Master/Slave with a form of token-passing. A Link Active Scheduler (LAS) device sends scheduled "Compel Data" (CD) commands to query slave devices on the Fieldbus for time-critical information. In this regard, Fieldbus is a Master/Slave protocol. However, when there's time between CD queries, the LAS sends out "tokens" to each of the other devices on the Fieldbus, one at a time, giving them opportunity to transmit any unscheduled data. When those devices are done transmitting their information, they return the token back to the LAS. The LAS also probes for new devices on the Fieldbus with a "Probe Node" (PN) message, which is expected to produce a "Probe Response" (PR) back to the LAS. The responses of devices back to the LAS, whether by PR message or returned token, dictate their standing on a "Live List" database which the LAS maintains. Proper operation of the LAS device is absolutely critical to the functioning of the Fieldbus, so there are provisions for redundant LAS operation by assigning "Link Master" status to some of the nodes, empowering them to become alternate Link Active Schedulers if the operating LAS fails. Other data communications protocols exist, but these are the most popular. I had the opportunity to work on an old (circa 1975) industrial control system made by Honeywell where a master device called the Highway Traffic Director, or HTD, arbitrated all network communications. What made this network interesting is that the signal sent from the HTD to all slave devices for permitting transmission was not communicated on the network wiring itself, but rather on sets of individual twisted-pair cables connecting the HTD with each slave device. Devices on the network were then divided into two categories: those nodes connected to the HTD which were allowed to initiate transmission, and those nodes not connected to the HTD which could only transmit in response to a query sent by one of the former nodes. Primitive and slow are the only fitting adjectives for this communication network scheme, but it functioned adequately for its time.